WASHINGTON -U.S. President Barack Obama's NASA budget does not match his campaign promisesabout the future of the U.S. space program, the Democratic chairman of the Senatesubcommittee that oversees NASA policy said Thursday. 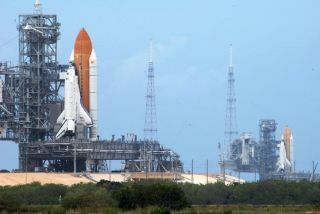 Sen. BillNelson (D-Fla) said he expects the budget figures to change after a three-monthreview ordered by the White House to take stock of NASA?s post-space shuttle humanspaceflight plans. Obama's2010 budget proposal orders a review of NASA's plans to replacethe space shuttle with new vehicles designed to serve the International SpaceStation and eventually carry astronauts to the moon. Nelson saidthe budget, which supports completing nine space shuttle missions before theend of 2010, is a step in the right direction. "Butdown the road the administration's budget does not match what candidate Obamasaid about the future of our space program. Still, he's assured me thesenumbers are subject to change, pending a review he has ordered of NASA,"Nelson, chairman of the Senate Commerce, Science and Transportation science andspace subcommittee said in a written statement. "This review, which shouldbe finished in 90 days, is an opportunity to nail down support for humanspaceflight." The budgetproposal endorses flying eight remaining missions before retiring thespace shuttle in 2010. An additional mission to deliver the Alpha MagneticSpectrometer to the space station will be flown "after these flights if itcan be safely and affordably completed in calendar year 2010," accordingto budget documents released May 7. But Nelsonsaid he had been assured by Obama that NASA will be allowed to finish "allnine space shuttle missions, regardless of how long it takes." All told,Obama is requesting roughly $18.7 billion for NASA for 2010, a 5 percentincrease that includes a roughly $150 million budget hike for the ExplorationMission Directorate - the part of NASA in charge of building the Ares I rocketand Orion Crew Exploration Vehicle that comprise the early elements of the moon-boundConstellation program. Of thenearly $4 billion Obama is requesting for Exploration Systems, $3.5 billionwould go to Constellation. While that is nearly $200 million more thanConstellation stood to receive next year under former President George W.Bush's final NASA budget, subsequent budget years are not as generously funded.Obama's plan calls for spending a total of $16.4 billion on Constellationbetween 2011 and 2013, or about $3.5 billion less than Bush had planned tospend during the same three-year period. However, asnoted in a NASA budget summary posted on the agency's Web site May 7, theConstellation budget figures are "placeholders" that will be updatedfollowing a review "led by an independent, blue-ribbon team ofexperts." Acting NASAAdministrator Chris Scolese announced during a budget briefing for reportersthat the blue-ribbon panel would be chaired by Norman Augustine, the formerLockheed Martin chief executive officer. Scolesesaid the review would also assess options for operating the International SpaceStation beyond 2016. He declined to speculate on what Ares and Orionalternatives might be examined during the review. Constellationhas been the subject of several reports released in recent weeks raising doubtthat the program can meet its schedule within the current budget. Obama'scall for a review of Constellation was praised by the Pasadena, Calif.-basedPlanetary Society, which previously urged NASA to collaborate withinternational partners in sendinghumans to the Moon while focusing human exploration efforts on near Earthasteroids and eventually Mars. "Theindependent review may help advance recommendations that The Planetary Society madein its Roadmap to Space," Lou Friedman, executive director of thePlanetary Society said in a written statement. "We have advocated thatmore international cooperation be incorporated into plans for the human returnto the moon, and this review is a chance to introduce exciting milestones onthe road to Mars." ElliotPullham, chief executive officer of the Colorado Springs-based SpaceFoundation, criticized Obama?s NASA request as ?disappointinglybusiness-as-usual.? ?Despitewhat appears to be an increase to the top line, the NASA budget continues amore-than-two-decade decline in real, inflation-adjusted dollars,? Pullham saidin a statement. As widelyexpected, Obama's budget includes more money for Earth science than thoseproposed by his predecessor. UnderObama's plan, Earth science would grow at a steady clip during the next fiveyears, eventually topping $1.6 billion in 2014 and overtaking planetary science- traditionally the best funded piece of NASA's science budget. Aeronauticsresearch is also in for an increase under Obama's plan, steadily growing from$500 million this year to $536 million in 2014. SpaceOperations, the part of NASA's budget that funds the space shuttle, andinternational space station, would get a $400 million increase for 2010, risingto nearly $6.2 billion before falling below $3.7 billion as NASA starts torealize savings from retiring the shuttle.